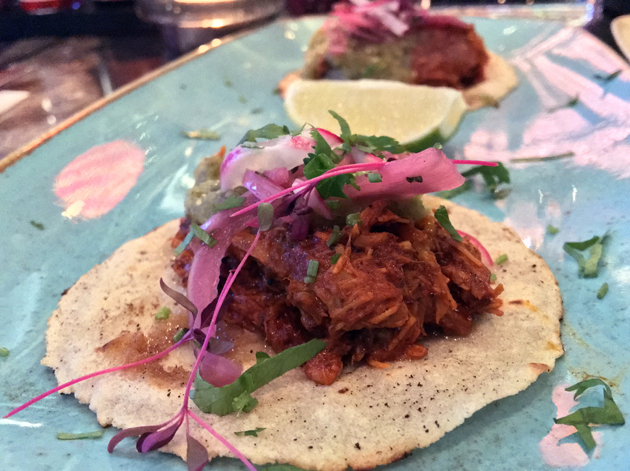 El Muro review – Mexican food comes to Muswell Hill. Sort of. It’s better than Tex-Mex. Just. Reviewing restaurants means I meander all over London, seeing firsthand the disparate boroughs, villages and neighbourhoods that make up this sprawling metropolis of ours. It’s tempting to think that once you venture outside of the capital’s core restaurant areas (Soho, Islington, Shoreditch and The City, or thereabouts), you would have the best luck in finding somewhere good to eat in wealthy neighbourhoods where the locals have more money to burn. It’s not quite as simple as that though. For a whole host of reasons too knotty to dive into any great detail here, it’s arguable that you’d have better luck in more diverse mixed-income areas. I’d rather take my chances with Deptford, Tooting, Haringey or Golders Green than the tidier but duller streets of Wandsworth, Kensal Rise or Bromley. That brings us to Muswell Hill, a pleasant part of town with few restaurants to catch the eye apart from El Muro. This Mexican restaurant has a menu that thankfully doesn’t consist of the ghastly, sickly baby food that is Tex-Mex. Unfortunately, the dishes struggled to impress. 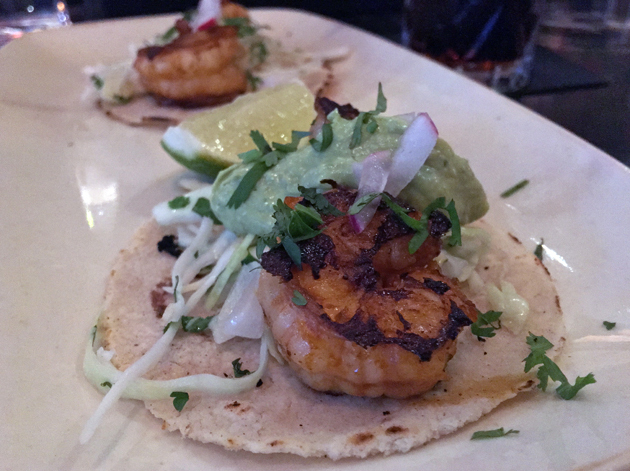 Tacos make up almost half of El Muro’s menu, but the tortillas weren’t up to scratch. While not inedible, they were bland and overwarmed almost to the point of brittleness. The fillings weren’t much better. Prawns were only modestly zingy and springy. They were limp enough to be outclassed by the shreds of sharp, almost tangy cabbage. You can eat at the small bar if you can’t get a table. Pork had a modest fruity sharpness, but this wasn’t enough to make up for the mushy texture of the meat mounds. Such inexplicably big and heavy plates for compact, bite-sized dishes. The best of the tacos in this first meal, by far, was the bovine option. Sinewy chunks of beef were earthy and moderately musky with a light meaty tang neatly complimented by hints of chilli and sharp onions. If only all the tacos had been as good as this. At least none of the tacos were as risible as the chicken quesadilla. The large wheat flour tortillas managed to be too brittle in some places and chewy in others. The melted cheese was duller than a bucket of grey paint, but I would’ve happily accepted more of it to counteract the dryness of the sadfaced chicken. 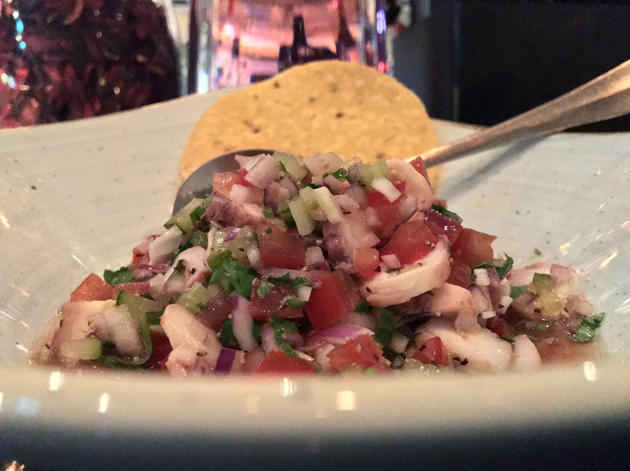 The best thing about octopus is its texture, which meant that chopping it up into itty-bitty segments for use in a ceviche/crudo-esque salad was almost predestined to produce a mistake. At least the tart tomatoes, onions and dressing were refreshing, as there was precious little else going on in this defacto salad. 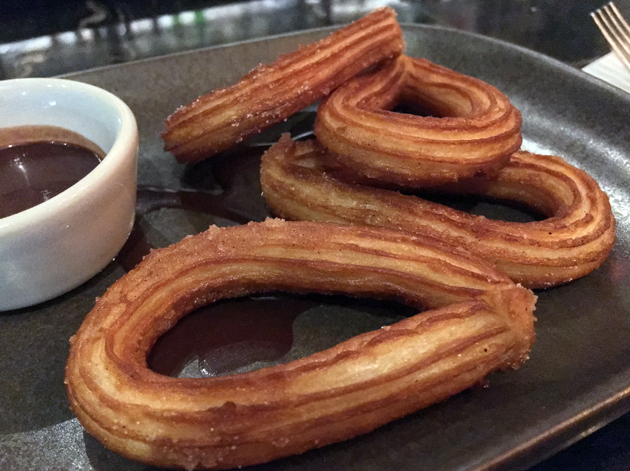 Churros were free from excess oil, but they were too thin which made it difficult to appreciate their fluffy interior. The insipid milk chocolate melted for dipping would’ve been a waste of calories and was left to rot. Do or dough nut. There is no try. 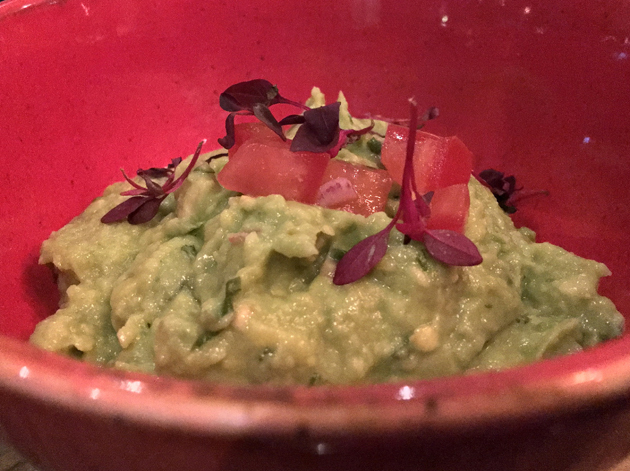 I’m not as smitten with guacamole as most of my dining companions, but I’ve still eaten enough of the stuff to be alarmed at El Muro’s version. My eyes widened and an eyebrow arched upwards at the watery and excessively lemony green slop that I was presented with. The stale-tasting tortilla chips on the side added another layer of insult. All the tacos came in the same half-hearted tortillas as before. The exception was the chicken tacos which used sheaves of lettuce instead, ssam-style. The chicken wasn’t as dry as the chook used in the quesadilla, but it was still an uninteresting bird. Its life had probably been snuffed out by drowning in a small swimming pool’s worth of sour cream and radishes. It’s Mexican food made by your well-meaning but incompetent provincial aunt who once saw a documentary about it on Channel 5. Lamb was moderately earthy, but a tad too mushy. When trying to recall the sauce the morning after, a blank glassy-eyed stare in my eyeballs was eventually superseded by a shrug. It was that unmemorable. 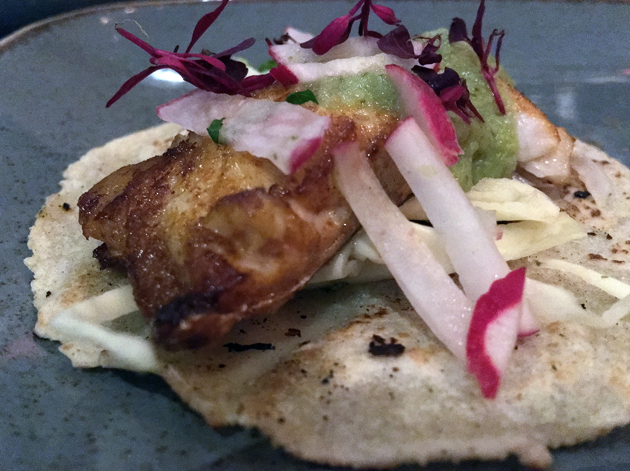 A taco filling of sea bream was surprisingly good, its freshness and zinginess truly palpable. These qualities were easier to appreciate given the uninspired sauces and cabbage that accompanied it. 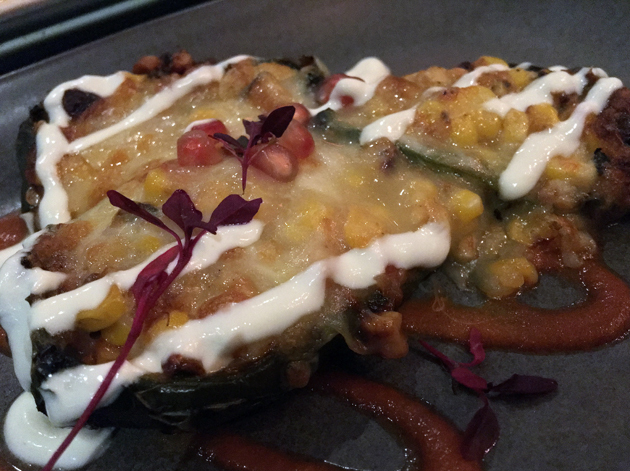 Chile relleno isn’t my favourite dish in the Mexican canon, but it deserves a better treatment than this. Peppers came stuffed with sweetcorn and a melted cheese with little to say for itself. The resemblance to the toppings scraped off a bad late-night vegetarian pizza was striking. 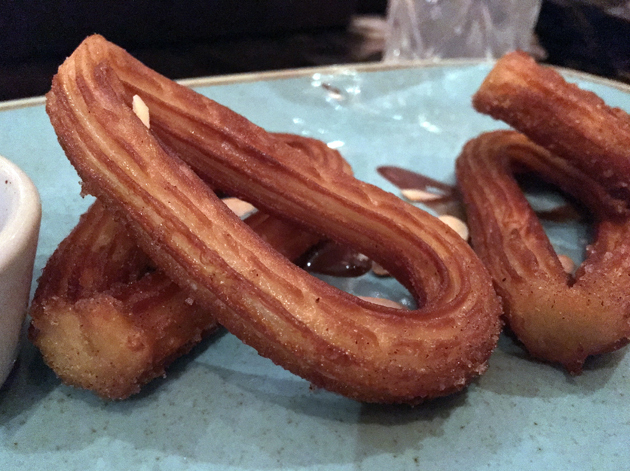 The churros were much the same as they were before. 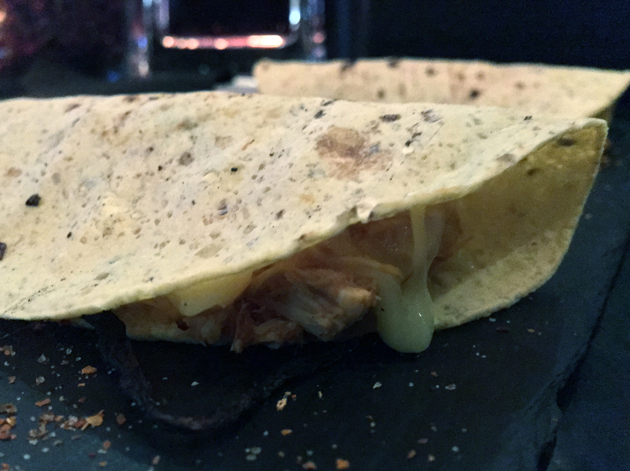 After some fits and starts, Mexican food in London seems to have finally hit a reasonable level of quality that’s just about sustainable with a good basis for further improvement. 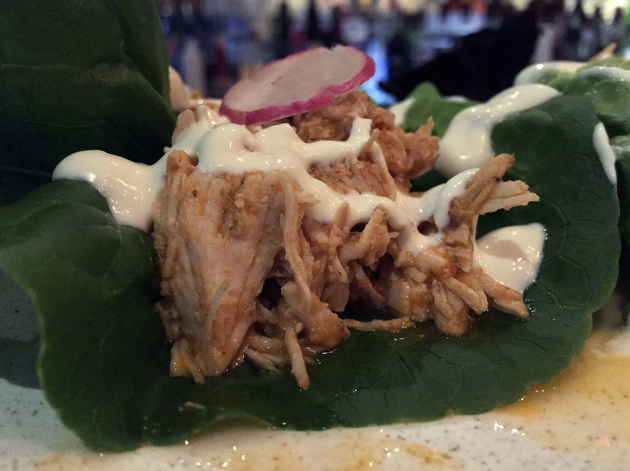 The suburbs should be a part of this virtuous circle of deliciousness, but El Muro’s cooking just isn’t good enough to be part of this rising tide. And that’s a real shame. 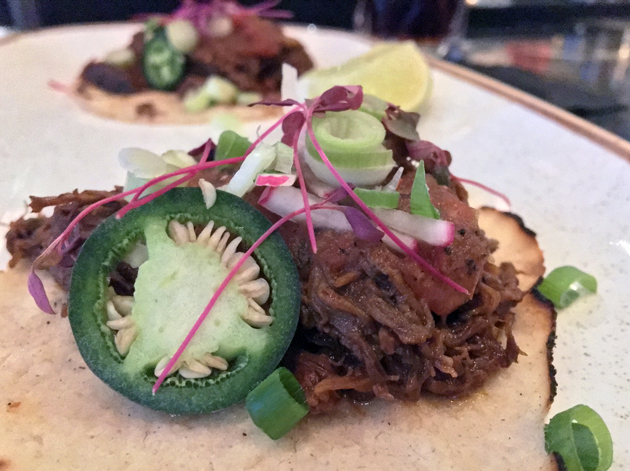 What to order: Beef tacos; Lamb tacos; Churros. Tentatively. What to skip: Just about everything else. Opening Hours: Monday-Friday 16.00-23.00. Saturday-Sunday noon-23.00. Total cost for one person including soft drinks (when shared between five) but excluding tip: £40 approx. 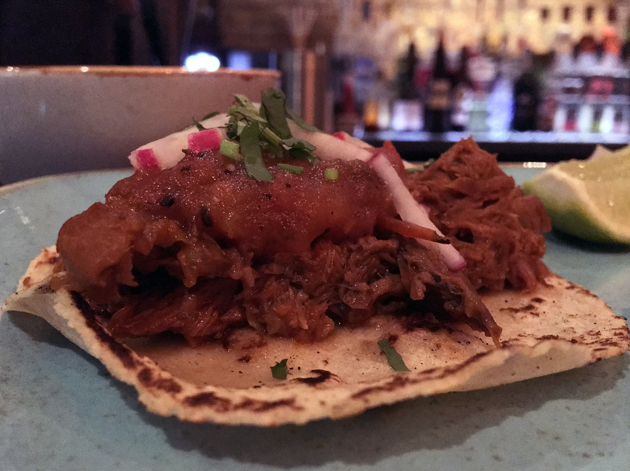 Tags: beef, ceviche, chicken, churros, el muro, guacamole, lamb, london, muswell hill, octopus, pork, prawns, quesadilla, restaurant, review, sea bream, ssam, taco. Bookmark the permalink.